Last week, California Polytechnic State University students in multiple unnamed Greek organizations at the San Luis Obispo campus held a party with the delightful theme of "Colonial Bros and Nava-Hos," managing to figure out how to be both incredibly racist, incredibly sexist and incredibly unoriginal all at the same time. And then the Pilgrims and Native Americans came together and ate corn and turkey and it was good. Men attending the party — identified in an email as having a "Colonial Bros and Nava-Hos" theme — wore Colonial-era costumes, while women wore sexually explicit Native American-themed attire. 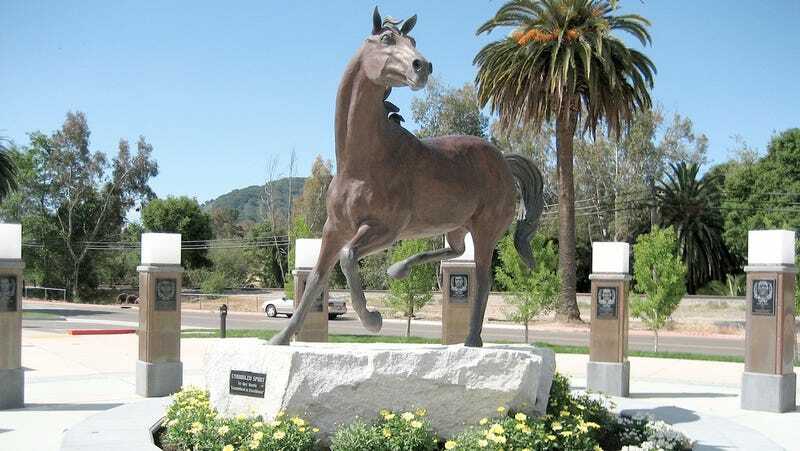 Per the Cal Poly newspaper the Mustang News, one faculty member identified Phi Sigma Kappa as one of three Greek organizations that hosted the party, though the names of the participating frats and/or sororities will not be released until the University decides whether or not to discipline them. A reported 75 to 100 people attended the event. Though the party is merely being investigated right now, President Jeffrey Armstrong sent an email denouncing it to the entire Cal Poly student body. "Let us be clear, events like these have no place in the Cal Poly community and are not reflective of the principles of The Mustang Way. Obviously, this was not a university-sponsored event." Personally, I don't think it was meant to be racist...It's unfair. We are taught that Thanksgiving is Pilgrims and Indians. There are a lot more offensive themes out there, especially during Halloween. I think people are too sensitive these days, not saying that the theme was not inappropriate, but there is so much more injustice in the world going on right now than a stupid frat party. I think the action taken is too severe due to the fact that the sorority and fraternity made a bad decision, but I don't think they were purposefully targeting these groups. This is pointless and makes the Greek community look bad for no reason. This theme isn't exactly original; in 2010, members of Harvard's Sigma Chi planned a Conquistabros and Navajos party, one that they probably didn't think up themselves either. The website College Party Guide breaks down all the details on how to host your own Colonial Bros and Nava-Hos party. "With Colonial Bros and NavaHos, you'll be bringing a little bit of America's history into the college forefront with a whole helluva lot of liquor," they write. Suggested decor includes real or fake tomahawks and women are recommended to at least throw some feathers in their hair. Cal Poly says it will host a discussion forum Friday to discuss issues of racism and sexism.